Founder and co-organiser, together with Jochen Oltmer, Ulrike Krause and Nora Markard. ‚Netzwerk Flüchtlingsforschung‘ was established in Berlin in June 2013. It is a multi-disciplinary network for refugee researchers in Germany as well as for researchers abroad working about refugees in relation to Germany. It collects and distributes information on refugees, forced migration and asylum as relevant to research, facilitates co-operation among researchers, and presents refugee research to the public. 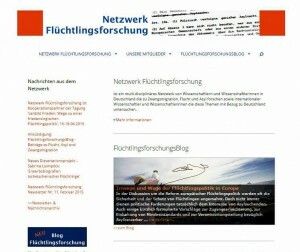 Netzwerk Flüchtlingsforschung also runs FlüchtlingsforschungsBlog, with reports about research findings, comments on refugee situations and policies, and reviews of relevant books and events. funded by German Research Foundation (DFG). In the last 30 years, research about flight, forced migration and asylum has established an interdisciplinary field. Considering an often practical outlook, ethical challenges and the necessity, to settle on shared terms and concepts across disciplines, foundational research has been neglected. In Germany moreover, refugee research is still in its early stages despite the societal pertinence of its topic. Relevant studies about forced migration as well as researchers working on these issues remain all too often isolated. The Scientific Network Foundations of Refugee Research brings together 14 scholars, from postdoctoral researchers to Professors, in six workshops over three years. It will facilitate discussion about challenges that are brought up in refugee research by principle terms and concepts, interdisciplinarity, the relationship of theory and practice, political processes of negotiation and frameworks of analysis, as well as by normativity and ethics. The aims of the network include the publication of a handbook on foundations of refugee research, the development of individual and collaborative research projects as well as the establishment of long-lasting scientific structures for a permanent interdisciplinary collaboration in the field of refugee research. Member; organised by Andreas Pott, Christoph Rass and Frank Wolff .